Initially when the 2017 Record Store Day Black Friday Event was announced, there was no U2 12-inch on the list. However, we had been told that there would be a release, but at that time we were told it would be “You’re the Best Thing About Me”. On October 26, 2017 it was announced that there would be a 12-Inch pressing of “The Blackout”. The vinyl would include the album version of “The Blackout” on one side, and “The Blackout (Jacknife Lee Remix)” on the other side of the vinyl. The vinyl was pressed at Third Man Pressing located in Detroit Michigan. This new pressing facility opened in early 2017. The vinyl was released in conjunction with Third Man Records, a label set up by Jack White of the White Stripes in Detroit in 2001. 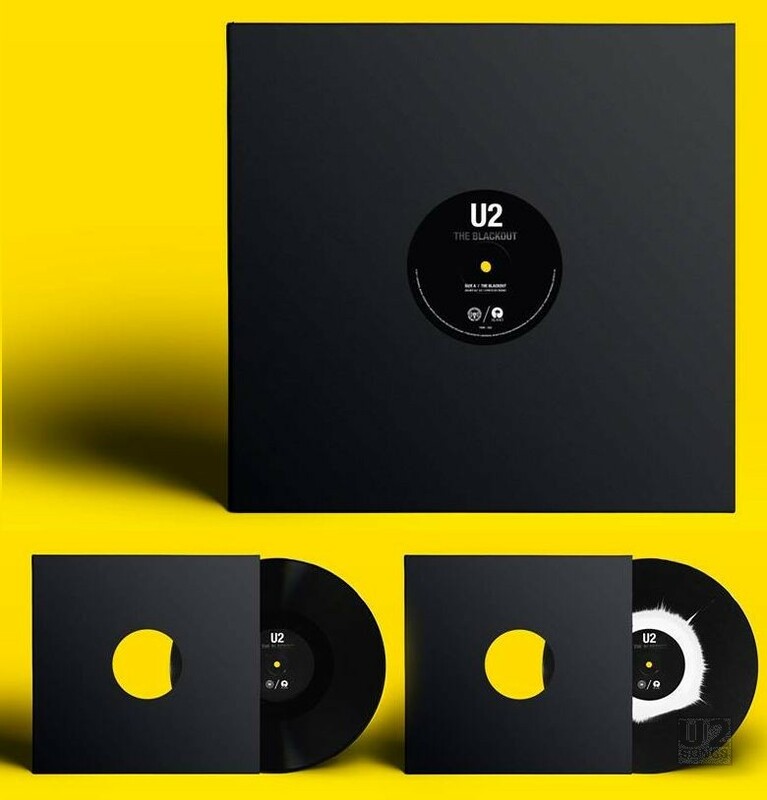 The vinyl was the first physical release of new music from U2’s Songs of Experience. Two versions of the vinyl was pressed. The most available vinyl is black vinyl from the edge to the center. There is also a limited edition colour vinyl with black vinyl at the edge but white vinyl in the middle. Once the label is applied the vinyl is supposed to look like the flare from a solar eclipse. The limited edition colour vinyl was only sold at four stores, with 750 copies pressed in total. Of those 750 copies, approximately 100 copies were sold at Freebird Records in Dublin Ireland, a further 150 copies were sold at Rough Trade East in London, UK, and the remainder of the copies were split between the two Third Man Records storefronts in Detroit and Nashville. We are told that over all the number of copies pressed of both the colour vinyl and the black vinyl is 20,000. Both the limited colour version and the all-black version contain the same label. Thus the catalog number on both is TMR – 522, although in some marketing materials the limited colour vinyl was advertised as TMR – 522X. The vinyl was packaged in a plain white inner sleeve, and then in a generic black sleeve, making it impossible to tell what version of the vinyl was in the package, except for the UPC sticker on the back of the stretch wrap which were marked “Regular Vinyl” or “Limited Run Vinyl”. Copies of the limited coloured vinyl sold only at the Nashville store were stickered in store, with a sticker that said “Limited Edition Coloured Vinyl” with the Third Man Records logo on the front. In a press release, Third Man co-founder Ben Blackwell was quoted as saying, “The sound quality of this incredibly special record is a perfect example of the caliber of product Third Man Pressing is capable of producing. We couldn’t be more proud.” The press information includes mention that the release will be extremely limited with just one single pressing at Third Man Pressing, the label’s vinyl production facility in Detroit. The vinyl was released just one week before Songs of Experiencewas released on December 1, 2017.